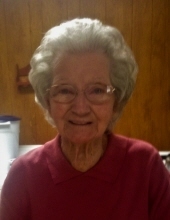 Ruby Hazel (Roach) Kelly, 92, wife of the late Joe Rex Kelly, of West Mountain, Texas, passed peacefully into the arms of her Savior on Sunday, January 27, 2019, in Longview, Texas. Funeral service will be held in the Chapel of Croley Funeral Home in Gladewater at 2:00 PM on Wednesday, January 30, 2019. Private interment to follow at West Mountain Cemetery. Born July 9, 1926, in the Hickory Hill Community of Titus County, Texas, Ruby was the daughter of the late William Jefferson and Nancy Elizabeth (McClung) Roach. She attended Cypress Community School and on September 29, 1950, she and Joe married and settled in Gladewater and then West Mountain, TX, where they raised their family, owned and operated West Mountain Oil and were members of the Oak Grove Assembly of God congregation for many years. Ruby especially enjoyed the outdoors and cooking for large family gatherings. There is hardly a creek, river or pond between Mount Pleasant and Gladewater that she hadn’t fished, or attempted to. She loved making big gardens, year round. The annual calendar of activity for her and Joe centered on preparing, planting, or picking the garden. And every chance to prepare and share a meal with her beloved family and friends, was cherished. Survivors include her sons Johnny Davis and wife Shirley, and Steve Kelly and wife Janet; grandchildren Johnathan Davis, Russell Davis and Ginger (Kelly) Olson and husband Justin; great-grandchildren Will Davis and Harvey Olson; brother-in-law Winston Kelly and wife Melba; sister-in-law Ann (Kelly) Perryman and a large extended family of nieces, nephews and cousins whom she loved dearly. Ruby is preceded in death by her husband Joe Kelly, parents William and “Lizzie” Roach, three sisters, three brothers and several half brothers and sisters. Ruby’s longing for the comfort of Jesus and her joy-filled journey to the Gate made of pearl is complete. To send flowers or a remembrance gift to the family of Ruby Hazel Kelly, please visit our Tribute Store. "Email Address" would like to share the life celebration of Ruby Hazel Kelly. Click on the "link" to go to share a favorite memory or leave a condolence message for the family.